Going big is a frame of mind. A word about the name "Wray". It's a family name and one of my nick names. Night running is something I have enjoyed immensely this winter. Not only does it provide solitude, it also gives me the opportunity to work with animal medicine for balance and healing. Earlier this winter, on one night run, the clouds were low…so low in fact they created a soupy fog. The sky was spitting a rather unusual rain and snow mixture, yet I ventured out into the vast whiteness. Visibility was less than three feet in any direction. The combination of my warm breath, perspiration and the descending slush caused my eyelashes to freeze and stick together. I also experienced a vertiginous sensation as the ethereal whiteness enveloped me. After crossing a creek on this particular trail, there is just one mile back to the trailhead, I jumped across the frozen creek and suddenly my headlamp illuminated a long slender deer leg. Stopping dead in my tracks, it took about a minute to process this appendage. I remember thinking, “What could rip off a deer leg?” (There was no deer body around.) Then I thought…. a big mountain lion could rip off a deer leg instantly! Yikes! I spun in circles, off-balance, swaying my headlamp left and right desperately trying to find the rest of the deer, the mountain lion or both. Where the hell was the rest of the deer body? the blood looked fresh. Where was the mountain lion? Feeling extremely exposed and afraid, I picked up a large gnarled log and proceeded to hike out the last mile to my car. In an effort to look unappetizing, I banged the log on the ground and began to growl. My chosen log could have been better because after a few taps it broke in two! Now I was welding a very broken log … all the while praying to Great Spirit for guidance and protection. Once home I shared this story with my daughter and from that time on, she’s affectionately referred to me as “Carries-Broken-Log”. Flash forward to yesterday’s lovely conditions. Daytime temperatures hovered in the upper 40s. My training schedule called for a 20+ miler. Late in the afternoon, I slipped on my muddy trail runners, comfy backpack, and dual headlamps then headed out for some mileage. For some reason, on this run, I did not bring my iPod. Last night seemed like an excellent time to immerse myself in nature’s lessons; listening, seeing, smelling, and feeling what Great Spirit has in store for me. While on the Mesa Trail, my headlamps suddenly illuminated two large eyes close to the ground. These were the largest animal eyes I have ever seen (and I’ve seen bears before!). The eyes were fixed square on me, stationary, unmoving. Mmmmm…I slowed to a walk and then with trepidation turned fully toward these glowing orbs. My headlamp illuminated a mature cougar crouched perhaps five feet from me. It was ready to pouch on its prey. In that moment, I felt very small, which I am not. I am 5’7” and 132 lbs. The cougar looked to be larger than me! Its front paws appeared broad and powerful. Staying completely calm so as not to send “fear hormones” to the cat’s nose, I spied a broken log not more than two feet from me. (Two feet closer to the mountain lion!) 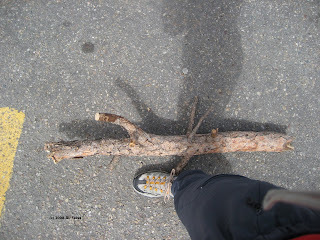 Calmly, confidently and slowly I took one step forward and slowly bent to the ground to pickup the broken log. Raising it above my head, I made all sorts of ridiculous growling and hissing noises, careful not to make any sudden moves, yet making sure this cougar knew that I was in-charge! The statuesque mountain lion never moved nor removed its eyes from me. With a growl and the broken log held high above my head, I began to walk away from it…. turning around every few feet to see if the cougar was tracking me. Then I talked out loud, very loud as a matter of fact…. thanking Great Spirit for keeping me safe and also for giving me powerful medicine to work with. I also gave thanks for that broken log. Carries-Broken-Log walked the next three-and-a-half miles with that log held high above her head, growling and hissing until she reached the parking lot. All content on this blog is (c) 2007-2008 by Jill Salva.